The friends and seekers continued to come to see Him until noon, at which time Mrs Parsons invited a number of them to dine with Him. Private interviews were granted in the afternoon on the second floor. He responded to questions about the interpretation of dreams, firmness and steadfastness in the Cause of God, the futility of opposition, the teachings of the Abhá Beauty, economic issues and so on. The Master then came downstairs to a public meeting where He spoke on the oneness of the Divine Essence. At the close of His address, He bade everyone farewell. A spirit of longing spread over the audience and with the utmost humility and reverence they begged His assistance and blessings. The fire of love blazed within them. After the meeting several people pleaded with Him to grant them private interviews. They were overjoyed when permission to ask a few questions was given. Some brought their children to receive His blessings. In the evening a meeting attended by both blacks and whites was held at the home of Mr and Mrs Hannen [1252 8th St.] As this was the last night of His stay, the meeting had a significance of its own and more than ever the hearts were filled with enthusiasm. When the Master arrived He was so tired that He went upstairs to rest for a brief time. When He heard the audience's restlessness and impatience, He allowed them to come to Him group by group. They came, kissed His hand and requested His assistance and blessings. Even though He was tired, each person received His kindness and blessings. He counseled them to be firm in the Cause of God and to hold fast to the mantle of love and union. When all these people concluded their visit, grateful for His bestowals, the Master came downstairs and spoke about unity and amity between the blacks and whites, expressing His happiness at seeing both races present in the meeting. During His talk He mentioned the sincerity, honesty and services of Isfandíyár, the black servant of Bahá'u'lláh. He took supper with a number of the friends. The host and hostess, Mr and Mrs Hannen, were overjoyed beyond measure because their services were accepted by `Abdu'l-Bahá and He bestowed upon them His special favors." Agnes writes that at 11:30 several of them called upon the Master, to find the lower floor crowded with people. He sent for them to come, but as there were so many people waiting, they made their stay short. After awhile, He came down to speak, giving a beautiful address. "He told us that we must not be concerned later, when the Cause is violently condemned--that it is in this way that knowledge of it will spread. He said we must regard all antagonist expressions as 'the little songs of the sparrows.'" He then went for a drive with her, taking Mirza Ali Akbar and Mirza Sohrab. 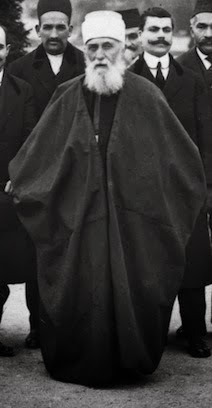 Just as they were entering the carriage, the "effort of Mirza Sohrab to close the window for Abdu'l-Baha, resulted in the coming out of the window upon my head, and although I was not hurt, being protected by my 'helmet' of a hat, Abdu'l-Baha asked with concern about me, and insisted that I should take off the hat, that He might make sure I was not injured. When I removed it, He blessed me three times, putting His hand upon my head. . . . " (136) They lunched at her home and a reporter came to interview Him that evening. When Agnes spoke of His going to Baltimore the next day, He said, "Not going to Baltimore." But Agnes said, "But my aunt is expecting me to lunch with her." Then He replied that if her aunt was expecting her, very well. So, that is how He came to decide to go to Baltimore! Wow. What a personal closeness that they shared. Don't you wish you could have a private interview, have dreams interpreted, and be blessed (literally) by the Master? But what a scene. . . . I can picture it, this final day in Washington, DC. I wonder if Alice Pike Barney, Laura, Louis and Louisa, or others were gathered that day. Why oh why weren't more records kept? A lesson for us now, in this 21st century. . . .